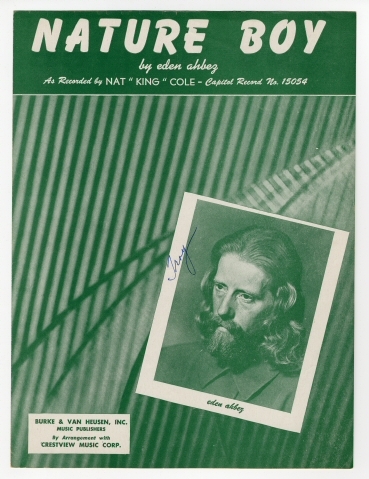 “Nature Boy” was written in 1947 by eden ahbez, the name adopted by George Alexander Aberle, who was born in Brooklyn, New York in 1908. In the 1930s, he lived in Kansas City and worked as a pianist and band leader. In the early 1940s, he moved to Los Angeles and began playing piano in a health food and raw food store run by John and Vera Richter, who followed a Naturmensch and Lebensreform philosophy influenced by the Wandervogel movement in Germany. In following their philosophy, he and other followers grew their hair long, became vegetarians and were, for all practical purposes, the earliest hippies. They called themselves The Nature Boys.At the suggestion of Johnny Mercer, eden ahbez approached Nat King Cole with his song “Nature Boy.” Unable to meet with Nat Cole personally, he left the song with Cole’s valet. Cole began to perform the song in his concerts; in 1947 he recorded it for Capitol Records, with an arrangement by Frank DeVol, who used strings and flute in his orchestration. The song was a big hit for Nat Cole and Capitol Records. “Nature Boy” was recorded in 2014 with Lady Gaga and released that year on Cheek To Cheek. It was arranged by Jorge Calandrelli.